The 2013 Istanbul Biennial, which set out to consider the public domain as a vital but imperilled forum for political expression, opened just three months after the onset of the Gezi Park resistance movement, to which the curator Fulya Erdemci responded by cancelling or relocating the projects that had been commissioned for public sites in the city. Despite that much-criticized decision, she oversaw a strong biennial that consistently took up positions consonant with those of the protestors. The 13th edition of the Istanbul Biennial was always going to be overshadowed by the resistance movement that sprang up in Gezi Park and spread across the country some three months before the opening. Initially directed at plans to raze the park and build a shopping mall on the site, the movement snowballed as brutal police efforts to suppress it galvanized other protestors, including many who saw the reaction of the government and security apparatus to the original occupation of the park as symptomatic of an increasingly authoritarian regime. In one notorious episode on 15 June, police fired tear gas inside the Divan Hotel near Taksim Square, where a number of protestors and bystanders, including many who were injured, had taken refuge. To date seven people have lost their lives in the protests. The first charge is a serious one. Erdemci’s decision to call off the projects sited in public areas of the city was probably not motivated only by her reluctance to petition the very authorities that were closing those spaces to the protestors – and it is tempting to speculate as to what other reasons she may have had. Perhaps, as Elmas Deniz has suggested, she was worried that new artworks by outsiders in Gezi Park and elsewhere would be viewed by protestors as frivolous intrusions.5 Perhaps, mindful of the heckling she had endured at the hands of Conceptual Art Laboratory, she was afraid that some protestors would take issue with the biennial on account of its ties with sponsors such as Koç.6 Whatever her reasons, her caution was bound to disappoint many. Conceptual Art Laboratory’s charge is serious too, but it is one that can be levelled against any number of exhibitions; it is more effective as a criticism of the institution of the biennial (or museum) than as an assessment of this or that show.7 It is also a charge that is more probingly formulated by Hito Steyerl from within the biennial than by Erdemci’s critics from without – but more on Steyerl’s intervention in a moment. For all the compromises Erdemci made, this is an absorbing biennial. Her caution is vindicated by the show itself, which advances views that are consonant with those of the protestors and advances them more powerfully for articulating them on its own terms. The largest venue, Antrepo 3, which is to be destroyed to make way for a new development on the site, possibly a hotel, is itself a potent illustration of the processes at issue in the biennial, as the ever-incisive Ayşe Erkmen intimates with bangbangbang (2013), the first work most visitors are likely to see. 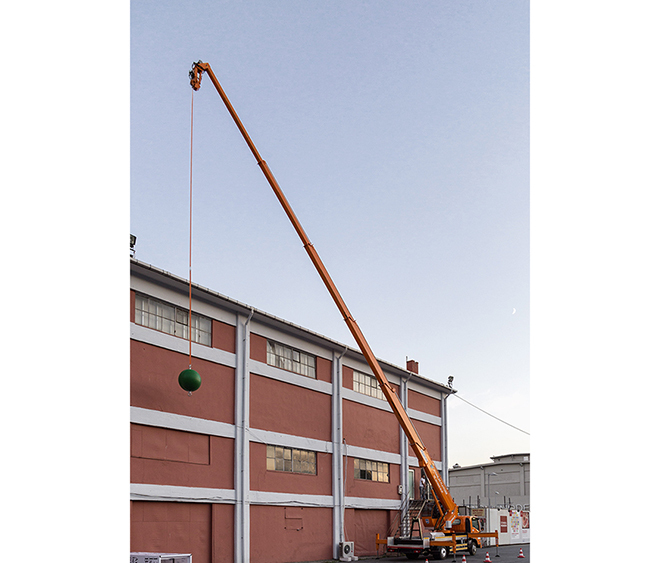 Situated just outside the massive warehouse, it consists of a large green ball, a buoy in fact, which is suspended from a crane on a long cable and swings and touches the building at hourly intervals. on the site of the warehouse will in time also be replaced. And inasmuch as the buoy is upside down, suspended from a crane rather than anchored to the seabed, the work may be read as hinting that property development in Tophane and elsewhere in Istanbul follows a logic that stands in an inverse relation to the needs of local communities; certainly, that logic is in turn inverted in the harmlessness of the buoy. Acting as a curtain raiser for the biennial, the work is both a compelling exercise in site-specificity and a clear curatorial statement of intent. The concerns that animate Erkmen’s work are apparent throughout the biennial. The privatization of public space is, for instance, squarely tackled in the display mounted by the Istanbul-based research collective Networks of Dispossession on the top floor of the Galata Greek Primary School, another major venue, just a short walk from Antrepo 3. The collective, of which the artist Burak Arıkan is a member, shows through a series of complex annotated diagrams which public and private bodies have most benefited from urban renewal policies in Istanbul, tracing the connections between them and the ties of specific construction concerns with the major media outlets, which have in the main glossed over the social, economic and ecological costs of the current construction boom. In the process it also highlights the roles of biennial sponsors in the promotion and execution of urban renewal projects; and it indicates that expropriation and redevelopment have affected minority communities in particular. The Galata Greek Primary School itself was confiscated and only recently restored by the treasury to its rightful owners – here too, the venue is not just an evocative setting but a building that exemplifies the processes that Erdemci and her team set out to examine. While displays like those of Networks of Dispossession are vital in providing a more fine-grained understanding of the urban transformations that are addressed in much of the work in the biennial and that fired the Gezi Park protests, many of the works on display rely less on knowledge production and more on specific interventions and allegorical responses. Annika Eriksson’s video I am the dog that was always here (2013), for instance, has a particular poetic urgency. In it we see a pack of dogs scamper about, frisk and sleep against a desolate, debris-strewn backdrop on the fringes of Istanbul, to which they have apparently been moved by local authorities intent on sprucing up their neighbourhoods. that is drawn between dogs and the victims of urban upscaling elicits both sympathy (dogs are well-loved pets) and moral queasiness. Eriksson is intimating that developers and public authorities treat the residents of condemned buildings and neighbourhoods like dogs but she is intimating it in terms that may be seen as replicating the offence and so provokes a potently ambivalent response in the viewer. A similar assessment is put forward in a completely different key by Halil Altındere, who collaborated with the hip-hop group Tahribad-I İsyan to make a pacy, engaging and intermittently violent music video that decries the transformation of the old Roma quarter of Sulukule to the west of central Istanbul at the hands of the Public Housing Project (TOKİ). Altındere’s work inaugurates the other central theme here: protest. The biennial may have withdrawn from the spaces where protestors gathered in the late spring and summer but it consistently touches on popular protest and its attendant cultural expressions, from the posters of the short-lived Dutch collective Provo (1965–1967), which organized public events in protest against the Vietnam War, local urban regeneration projects and other developments of the time, to the hip-hop of Tahribad-I İsyan and Altındere’s video-tale of young men on the rampage in the ruins of their old neighbourhood. Bertille Bak’s short film Safeguard Emergency Light System (2010) is another pivotal work, serving like Altındere’s video to link the politics of urban renewal with the aesthetics of protest. It shows the residents of a condemned housing complex in the Din Daeng neighbourhood of Bangkok as they learn to play a revolutionary song, the score of which has been transcribed for flashlights, in protest against their eviction and the failure of the local authorities to compensate or re-house them. The film culminates in a ‘concert’ in which the mostly female residents stand on their balconies in the fading light and intermittently flash their torches in a tightly co-ordinated and affecting performance that points in its silence to the indifference of the authorities but also demonstrates the residents’ anger and commonality. This work is not dissimilar in spirit to the gesture of Istanbul’s ‘Standing Man’ (the performance artist Erdem Gunduz), who on 17 June simply stood for eight hours in Taksim Square, facing the Ataturk Cultural Centre, and who was soon joined by hundreds of sympathizers. Just as effective as Bak’s film is Maider López’s Making Ways (2013), a three-part work that includes video footage of pedestrians negotiating traffic at a busy intersection in the centre of Istanbul, a photograph on which the trajectories of selected pedestrians have been traced in blue and a list of instructions for crossing busy thoroughfares. An exercise in Debordian psychogeography, Making Ways maps intersecting regulated and unregulated urban currents and hints at both the dangers and rewards of improvising ways of negotiating urban space. Ingeniously, López seems to establish a connection between walking and protesting; her list of instructions for pedestrians can also be read as a manual for protestors (‘Find the right moment… Decide and commit… Self-organisation creates collective ways…’). The implication of such a reading is that protest may at times be a necessary extension of the daily effort to insert oneself creatively into the urban fabric. A few works here more directly reproduce the codes and procedures of popular protest, but they are in the main less convincing than the relatively oblique pieces of artists like Bak and López. Christoph Schäfer, for instance, has made a large number of charcoal drawings and maps that seem to have been inspired by conversations with protestors in Istanbul. His maps bear slogans and highlight the areas most affected by the protests, while the drawings alongside them feature hairy manikins and describe, in a scratchy, energetic idiom, the lifestyles and solidarity of the protestors. Quite apart from the triteness of some of the slogans and captions (‘Istanbul is an accumulation of differences. In it’s [sic] streets you find traces from every place in the world’), Schäfer’s more thoughtful observations are swamped by the logorrhoeic jumble around them – and the inference that a naive, caricatural visual language is the natural complement of organized resistance is at best unhelpful. On the other side of Antrepo 3, Jorge Galindo and Santiago Sierra show their short video Los Encargados (2012), which follows a convoy of black sedans as it proceeds along Madrid’s Gran Via in a motorized parade that is both a protest and a funeral cortège, each car bearing on its roof a large up-side-down portrait of one of Spain’s post-fascist leaders. The symbolism here is leaden and the tone portentous. Of the pieces that engage with specific protests, in Turkey and elsewhere, the most convincing are not those that arrogate the traditional forms of protest, the procession or slogan for instance, but those that probe and reinvent them, occasionally bringing them to bear on novel concerns and experiences, such as the crossing of a busy street. So in examining the public domain as a crucial but imperilled site for political expression, the biennial focuses on two concerns in particular, public protest and the privatization of public space, but it also treats various related issues. Works arranged in one corner of Antrepo 3, including Galindo and Sierra’s video, consider the fate of the monument, using monuments as conversation pieces, expanding on their historical resonances, proposing anti-monuments, and so on. In Arter, another biennial venue, a number of works reflect on the temporalities that condition our experience of public space. But although Erdemci and her team have created these and other clusters in the various venues, the layout is more freeform than at the last biennial, overseen by Jens Hoffmann and Adriano Pedrosa. While Hoffmann and Pedrosa hired the architect Ryue Nishizawa to divide the venues (in 2011 there were just two) into variously proportioned spaces that allowed them to create multiple shows-within-the-show, Erdemci opens the display areas up, using walls only where she has to. This curatorial style has its disadvantages; quiet, undemonstrative works – Carla Filipe’s investigations into the history and current holdings of an old bookshop in Oporto, for instance – fare less well in such an environment. And the soundtrack of one work can interfere in the viewer’s experience of another. But in the context of this biennial an open-plan arrangement has an advantage that outweighs these drawbacks: it is consonant with the public domain understood as an open, non-hierarchical and necessarily cacophonous forum. One more piece has to be mentioned here. At the very centre of Antrepo 3 is a work that may be seen as a quizzical postscript to the whole biennial. 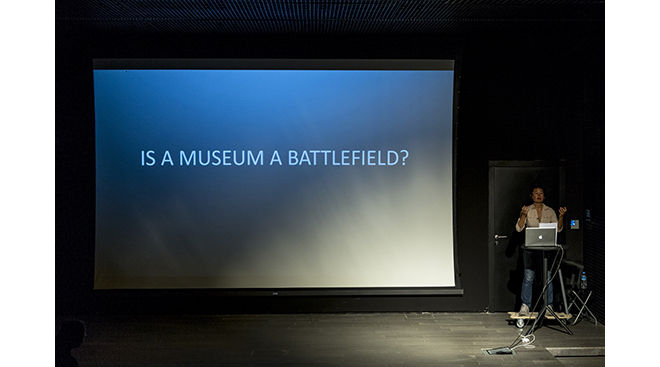 Hito Steyerl’s Is a Museum a Battlefield? (2013) is a film documenting a lecture-performance in which the artist uncovers connections between the arms industry and various art-world institutions, including the Istanbul Biennial. In characteristically looping style, Steyerl traces pieces of military hardware and software back to their makers, including the bullets and missiles that were used in an attack on Kurdish rebels that took the life of her friend Andrea Wolff. And she notes with bitter, punctilious humour that senior figures at several of these weapons manufacturers, including General Dynamics and Heckler & Koch, have supported major art institutions, the Royal Academy of Arts for instance, just as Otokar, a maker of military vehicles that is owned by Koç, is indirectly associated with the Istanbul Biennial. In answer to the question in her title, she concludes that if museums and biennials are to be genuinely public spaces, the revolutionary spirit that motivated the storming of the Tuileries and the founding of the Louvre in 1792 will have to be revived. So in Steyerl’s piece, as in the diagrams of Networks of Dispossession, the biennial reflects on the contradictions that underlie it. It might be said that the inclusion of displays that adopt a critical perspective on the biennial itself is a toothless – even cynical – gesture that simply illustrates the increasingly seamless institutionalization of institutional critique. But given the general tenor of the biennial, given that it consistently and powerfully disparages the privatization of public space, that would be harsh. In this context Steyerl’s contribution in particular comes across not as a parenthetical apology but as a logical extension of the critical reflections articulated throughout. that articulate them in specifically artistic terms, drawing on resources such as allegory, symbolic displacement, ambiguity and indeed self-reflexivity – resources that are proper to artistic practice. So the withdrawal may not be such a loss after all. On the evidence of this biennial, the most potent way for artists to support a protest is to work with their own means in parallel to it. 6 Incidentally, the Divan Hotel belongs to Koç, which has recently been subjected to tax probes that have widely been interpreted as retaliation for the sheltering of protestors over the summer. Marcus Verhagen is an art historian and critic with a doctorate from the University of California at Berkeley. He has published in periodicals such as Representations, New Left Review and Afterall and he is a regular contributor to Art Monthly.